The Legendary Mount Dora Catacombs…Seriously! In keeping with the NaNoWriMo theme I started earlier this month, Alas, Babylon by Pat Frank was unknowingly left off my list of Florida books. 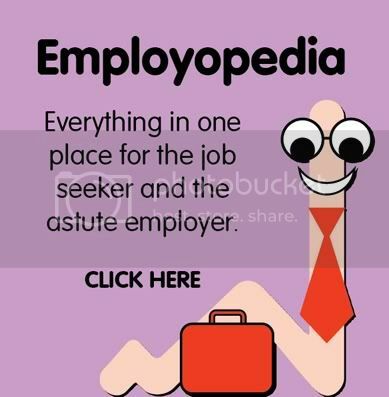 Had I known then what I know now, this best seller would be right at the top! During my recent foray to Mount Dora, I had the pleasure of sitting in the Mount Dora Coffee House reading a quarterly magazine called Pulse, which covers local events in Lake County. In an interesting article entitled “After the Apocalypse” by Mari Henninger, I read author Pat Frank was living in nearby Tangerine, Florida when he penned the classic novel in 1959. Apparently Alas, Babylon‘s quaint town of Fort Repose was actually based on Mount Dora. 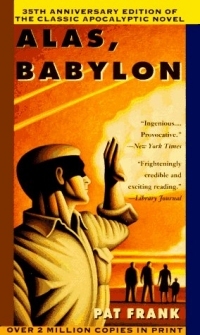 Now, for those of you who haven’t read Alas, Babylon, this was the first important novel written in the nuclear age, speculating on a post-apocalyptic world. FYI–author Pat Frank depicted the town leaders as bumbling fools, so the Mount Dora leaders, who knew full well the town was based on them, weren’t too pleased! However, the novel’s effect was legendary, spawning a whole legion of post-apocalytpic books and shaping a generation of writers. It had quite an effect in town as well, and during this time of bomb-shelter building, Mount Dora was no exception. In fact, several families got together and built a huge underground fallout shelter called The Catacombs. “It is a 5,000-square-foot underground fortress complete with a kitchen, a recreation room, a medical facility, a sewage system and an air-conditioning and filtering system. Dubbed ‘The Catacombs’ by the select group of families who had the secret shelter built, it was designed to allow as many as 100 people to dwell underground for more than half a year. The families — including the city’s mayor, county superintendent of schools, a local bank president, a farmer, several doctors and a minister — planned to hunker down while a nuclear firestorm consumed those left outside. Twenty-five families had private rooms in the complex, each large enough to shelter four people. Each family paid about $2,000 — a sizable sum at the time — for the chance to survive. The underground complex even included its own weapons arsenal to ward off jealous neighbors who might want to enter, as well as a huge collection of seeds to provide a food supply afterward. The owner of the land under which the Catacombs were built had claimed he was simply putting in a tennis court…yeah, keep that in mind next time your neighbors are doing some construction! And apparently the location of the Catacombs is still kept secret… hmmm…. guess what I want to look for on the Top 5’s next visit to Mount Dora! Anybody wanna come? Mount Dora: Goblins and Goblets of Wine, Oh my! So as part of her innkeeper duties, Ana Tuttle had several good suggestions and made all of my reservations for me! And the place we went for dinner on Saturday night is a local favorite: The Goblin Market. The entrance is tucked away on a back alley, and you feel as if you are headed to the Leaky Cauldron in Diagon Alley (for you Harry Potter fans!). And, if you don’t mind dining amid skulls and trolls overlooking your meal (yes, it was decked out for Halloween), or the many bookshelves and withering vines, then you will be right at home. Edgar Allan Poe should have dined thusly! But, don’t be confused by the fantastic goblin theme, as The Goblin Market is nicer dining at $25 to $30 an entree… and what fine gourmet it is! I had crab bisque soup and friend pumpkin ravioli, while @swimmerjoe at a gourmet chicken pizza with gouda cheese. Yum! And, if you arrive early (yes, you probably need reservations) then you can head upstairs to the lounge and bar area, another local hang out. On our walk home, though, we stopped in at another local favorite, The Wine Den. This intimate place was welcoming with a knowledgeable staff who had great wine suggestions. The Wine Den was a great place for a night-cap… love it! So, this concludes our fabulous time in Mount Dora. We returned home feeling refreshed, renewed, and restored to sanity. 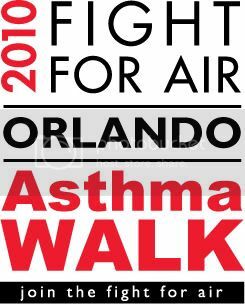 Thanks, Mount Dora! 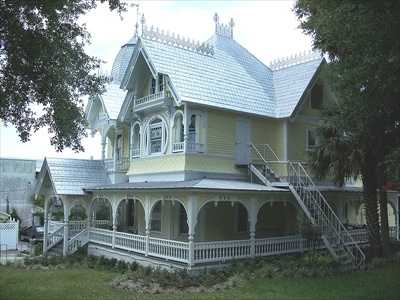 Mount Dora Garden Gate Tea Room: A Heavenly Delight! Yeah, @swimmerjoe was pretty cautious at first, sagely noting there were NO men in the Tea Room. And, the flowery tea pots and white table cloths seemed a bit alien to my he-man hubby. Never fear, though, as two other men did bravely venture in (eventually), and guess what? Halfway through the High Tea, @swimmerjoe listed the Tea Room as the trip highlight thus far! Really, he did! So, to continue our stay in the place far, far away, @swimmerjoe and I ventured out the next morning into the charming Mount Dora. 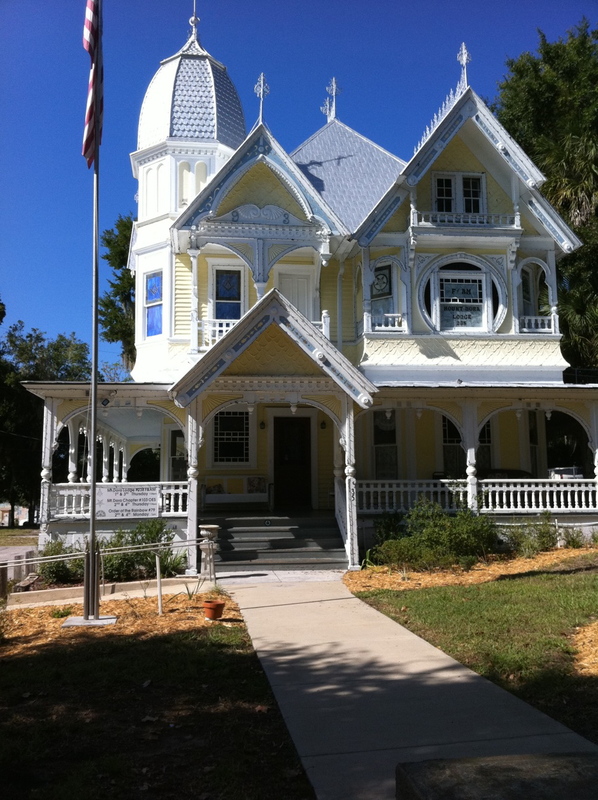 The nice thing about the Mount Dora Historic Inn is its location. It is quite literally one short block (does a half of block even count?) from the quaint downtown, which is where you want to be. This is where all the cute shops and fabulous restaurants are located. Top 5 editor Bess Auer with Ana and Jim Tuttle. So park your car at the Inn, and then enjoy the stroll down the old-fashioned street scape. Where else can you find an old house like this? The old Donnelly House, now a Masonic Lodge. 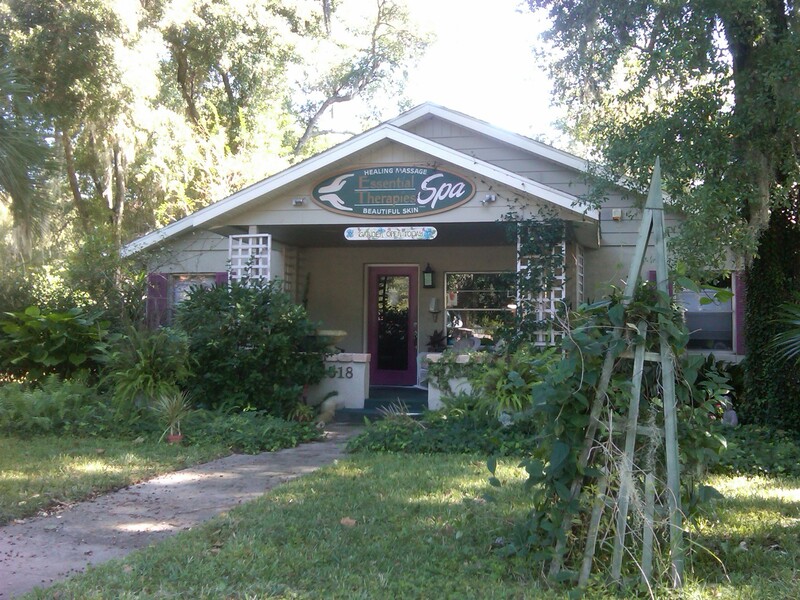 Mount Dora has an assortment of great day spas, and since this was @swimmerjoe’s birthday weekend, I planned a special couples massage at Essential Therapies Garden Day Spa, which is converted from an old house. 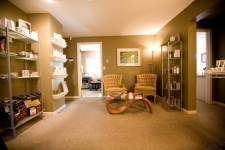 Don’t let this fool you, as inside is as professional-looking as any uptown spa in Central Florida! And after a soak in the garden jacuzzi, where they had tea and star fruit set out for our nourishment, we were treated to a royal rub down. Both massage therapists knew their stuff, mine specializing in neuromuscular massages (for my aching back! ), and @swimmerjoe’s in sports massages, to match his athletic tendencies. Fabulous! The Top 5 spent a magical weekend far, far away…. or at least it seemed like it! We headed to a North Carolina town, a New England hamlet; a hilly place with a quaint street scape, a place of yesteryear; a town with fantastic gourmet eateries, unique boutiques, and the friendliest people you will ever meet…and it is all just 30 minutes outside of Orlando! When deciding what to do for my hubby’s birthday, I had big ideas: Stay at the Biltmore or the Grove Park Inn (we love North Carolina after all). However, time and money being what they are, I had to make some quick decisions. Yes, we wanted to escape the Rat Race. Yes, we wanted some place with incredible restaurants, spas for pampering, good shopping, and a wonderfully ideal place to stay. No, I didn’t want to spend a fortune, and no, we didn’t have a week, only a weekend. So, I focused on Mount Dora, a place we had visited but had never stayed. So, after asking a few questions of some tweeps in the know, the Mount Dora Historic Inn was named as the place to stay. Owned by Jim and Ana Tuttle, the Inn, which was built in 1880s, is a delightful bed and breakfast, the breakfasts are to die for! Everyone was correct: The bed and breakfast is beautiful and comfortable, and the food sumptuous. The other guests at the Inn were equally charmed, and one couple from Connecticut said they felt like they were still in New England. Mount Dora feels more like North carolina to @swimmerjoe and me, but either way, it sure doesn’t feel anything like Orlando! 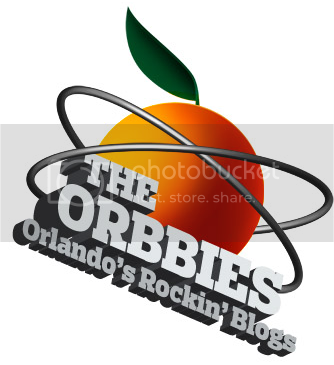 Check back soon to see what neat things we did in Mount Dora. Nope, I’m not talking about Orlando’s Magical Dining Month–which is an exceptionally great deal!–but rather one of the longest-running Off-Broadway’s musicals, Little Shop of Horrors. You can get your fill of fun at the IceHouse Theatre in lovely Mount Dora. Now entering their 63rd season of production, the IceHouse Theatre is know for its quality shows. Little Shop of Horrors opens September 17 and you can get tickets from $10 – $20. Jennifer Guhl as Audrey, with the Rhythm & Blues-singing plant, "Audrey 2". Photo by Scott Hodges. 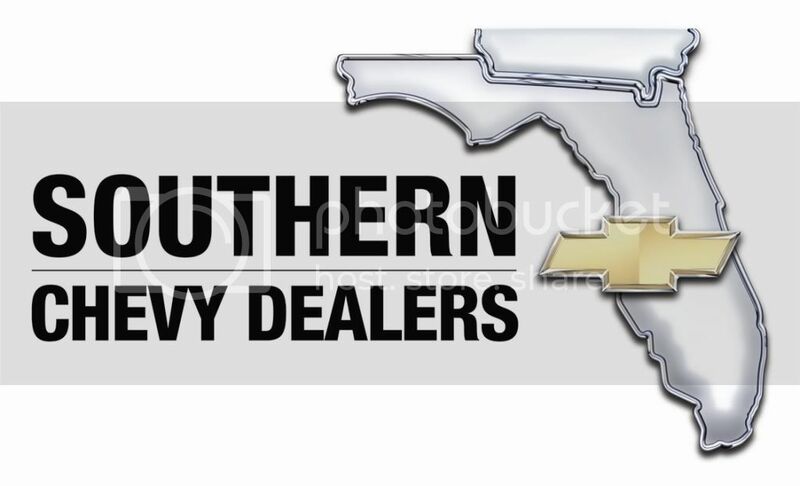 So, Mount Dora isn’t the highest place in Florida? On Friday evening, the Top 5 headed to Mount Dora for a “Tweet Up.” For those of you unfamiliar with this term, a tweet up is a face to face meeting between Twitter users, and in this case, some major ones. The Twitter user @MountDora has over 11,000 followers and helped to place the City of Mount Dora on the virtual grid with his website What to Do in Mount Dora. As a frequent virtual visitor, I was thrilled to finally meet owner Brian Young in person. He also owns Tremain Street Cottages and so he commented on how using the social media sites like Twitter has helped bring a measurable number of new visitors each weekend to Mount Dora. Unfortunately, Brian’s better half, Rachelle Lucas (@travelblgger on Twitter – over 22,000 followers) was in Winter Park filming. I guess I’ll have to wait until my next visit to meet her! Her videos can be seen on her food blog Inn the Kitchen. 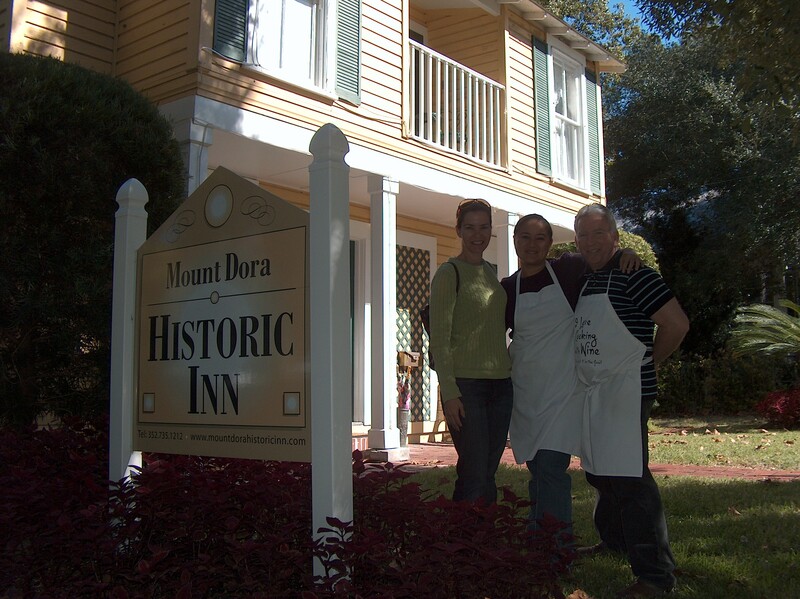 I also met Jim and Ana Tuttle (@MountDoraBnB on Twitter) who own the Mount Dora Historic Inn. It was wonderful how I was welcomed with a warm hug from Ana, as if we were old friends… instead of just old virtual friends! Everyone in Mount Dora was this friendly, though. Welcoming us “tweeps” as we descended on Mt. Dora Sushi who graciously opened their doors (and beer garden) for us. (@MtDoraSushi on Twitter, with over 17,000 followers.) This restaurant is well worth the drive to Mount Dora, which was surprisingly easy thanks to the new 414 that has opened up. It only took me 20 minutes door to door! All in all, I thoroughly enjoyed my jaunt to Mount Dora. I am looking forward to going back for a weekend stay with my husband…now the only question is in which bed and breakfast do we stay! Oh, and the answer to the title of this blog post? At 184 feet above sea level, Mount Dora is indeed a “mountain top” town, but, nope, it is not Florida’s highest. That distinction belongs to Britton Hill, at Lakewood Park, Walton County, 345 feet above sea level.